I have been spending a lot of time attempting to find a pointing error in the antenna. The problem is that the antenna is very accurate in the first 90 degrees of elevation but after traveling into the second 90 degree area it will 'loose its way' coming back. Its off as much as 40 degrees and needs to be homed every time. At this point I don't know if its a mechanical error (some non-vertical component of the mechanical stuff) or, more likely, some dumb software bug put in by yours truly. I am also burned out looking for it and might put aside for a while. Went over every line of the software. I found lots of improvements but nothing that would cause this problem. I even toyed with the idea of making the calculations different moving up from down but that would simply have hidden the problem (bad idea). Looked at the phase A and B signals coming out of the elevation encoder. Phase A looked fine but phase B was to narrow. Replaced the Hall Effect IC's on the encoder. First time around I forgot to add the pull up resisters (3.9K). Looked good on the 'scope. I'm now waiting for the wind and rain to die down so that I can replace the encoder on the motor. 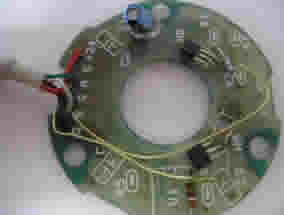 The pc board was the one used on the old SETI Net rotor motor. It was designed many years ago when Hall Effect devices required a lot of support chips (Op Amps) but mechanically the board fit so it was reused. I had to flip HA over to get it closer to 90° fro HB. It seems to work fine. 2009-02-16 - Well replacing the encoder did NOT fix the problem but I did finally find the problem - The gears on the damn rotor are stripped. When I would move the antenna up the extra load on the motor (gravity) causes the worm gear on the motor shaft to jump teeth on the next gear in the chain. This is a serious problem as that motor is not a common type and will be hard to find parts for it. The good news is that the motor can be removed from the antenna easily. The old system required that the whole antenna be removed from the rotor and then the rotor removed, lugged down to my workshop (90lbs) and the case removed to get at the motor. On this system its simply three bolts and out it comes. I did find and buy a right angle drive motor at the local surplus store but it seems lighter than the one that is stripped. Looking at the mount it may be possible to mount a tough Oriental Motor gear box on the same plate and have the motor mount to that. It would not be a right angle drive but it looks like it might clear anyway. Until I decide what to do I can continue to use the system so long as I don't have to move the elevation a lot. 2009-02-24 Replaced the Motor - I decided to replace the stock motor (above) with the motor from my old rotor. This motor is not a right angle drive so I had to build a transition plate to pick up the mounting holes on the antenna and the holes on the motor. The following show the construction of the plate and attachment to the rotor mount. A test of the motor from the local control box shows that it works fine. 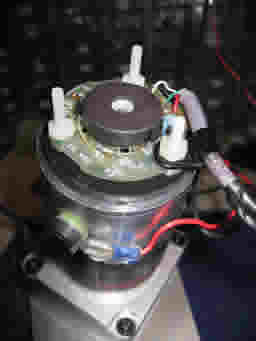 The new motor has a shaft out the rear that I use to attach the encoder. This turns much faster than attaching the encoder on the output of the gearbox the way it had to be done on the old motor. With this arrangement I expect approximately 100,000 encoder counts for 180° movement much more than the 3,000 or so counts from the old system. This way if I miss a count or twelve because of noise in the system it won't change the calculations much (how's that for being scientific). 2009-02-25 - Finally solved the problem. The new motor works great and the encoder does it job as well. You can't ask for much more than that. A complete movement from +6° to + 172° generates 447,727 pulses and is very repeatable. Now I can finally get on with it. Add fourth Kerr controller to the system. This will be used to control the power to the noise source. I would like to open up the video server (9100A) and see if I can see an analog audio filter that I can defeat.